From creators of international smash-hit The Adventures of Alvin Sputnik: Deep Sea Explorer comes an epic western about redemption and dementia. As the sun sets, an old man goes wandering into the night. He is swept up in a surreal western, on the run from a mysterious tracker hell-bent on hunting him down. 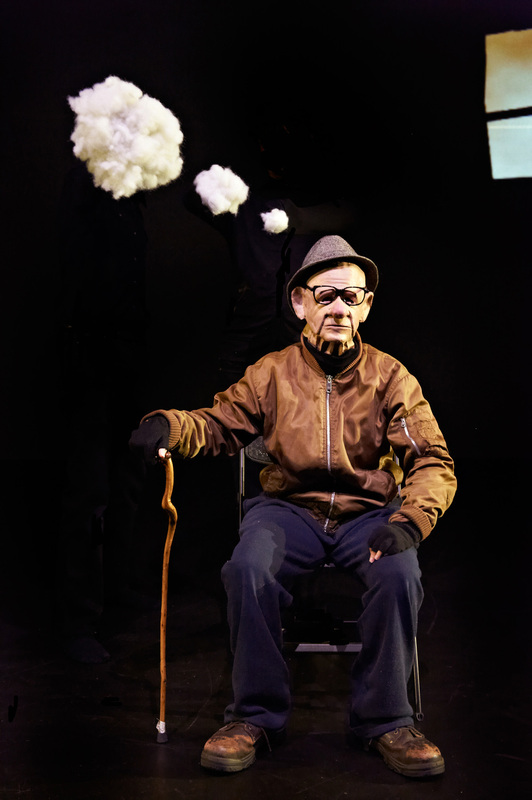 A heartfelt exploration of dementia told through puppetry, mask, animation and live performance, this award-winning adventure tells the tale of an old man chasing his memories as they escape into the wild. Created by Tim Watts, Arielle Gray and Chris Isaacs. Music Composed by Rachael Dease. Ages 8+ for general audiences and 12+ for student audiences. Best suited to intimate/medium theatres and audiences of 100-400. 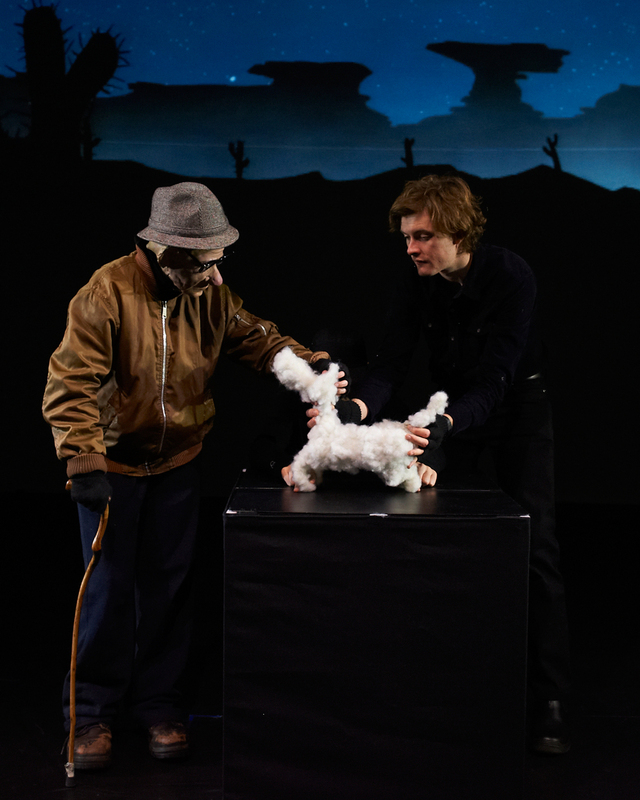 The Adventures of Alvin Sputnik: Deep Sea Explorer is a multi award-winning one-man micro-epic puppet show that melds technology and multimedia into a touching story of enduring love and the end of the world. The seas have risen, billions have died and those who are left live on farms atop skyscrapers, atop mountains. The scientists have tried everything. Floating islands sank, space probes found nothing, and the giant sponges, visible from the moon, are now rotting icons of failure. Now science and humanity are turning to the oceans themselves. A last ditch effort to save the human race requires journeying down through the mysterious depths of the deep blue sea to find a new place for us to live. Alvin Sputnik, who has just lost his wife, accepts this perilous mission so that he may to follow her soul down to the underworld so that they can be together again once more. Created by Tim Watts, who employs an unique blend of mime, puppetry, live and recorded music, and animation to present an exploration of the next and oldest frontier: the deep blue sea. Ages 8+ for general audiences and 12+ for student audiences. Best suited to intimate theatres and audiences of 50-250. From the award-winning creators of The Adventures of Alvin Sputnik: Deep Sea Explorer and It's Dark Outside, comes a dark tale of reaching for the impossible. One hundred years after birds have disappeared from the skies, Dr Mary Miller has found a way to bring them back. As her dream becomes her obsession, reality begins to crack, allowing a dark fantasy to hatch. The imagination can be a dangerous thing. Blending puppetry, animation, music, and live video, Falling Through Clouds is a joyous and heartbreaking tale about the relentless pursuit of flight. Ages 8+ for general audiences and 12+ for student audiences. Best suited to intimate/medium theatres and audiences of 100-500. The bond between a dog and its owner is heartbreakingly profound. But what happens when that owner dies? From the creators of Alvin Sputnik, Its Dark Outside and Falling through clouds, comes a new show about what happens when a dog gets a new owner, and an owner gets a new dog. Its about love, loyalty, and the expectations you bring to a new relationship. The show is currently in development and will be premiering in October 2016 at the AWESOME Festival. Created for 8+. Best suited to intimate theatres and of audiences 50-250.